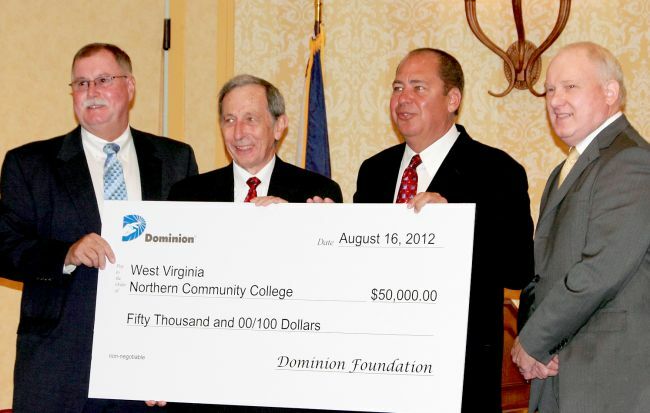 West Virginia Northern Community College has received $50,000 from the Dominion Foundation for a cutting-edge simulator to meet the demand for highly-technical professions associated with the development of Marcellus Shale resources. Dr. Martin J. Olshinsky, president of Northern, said the “funding is coming at an opportune time because the college’s expansion in Weirton and Wheeling includes classes in Mechatronics,” which awards an associate in applied science degree in a new program designed to prepare individuals to be electrical and mechanical maintenance technicians. New extraction methods utilized in the Marcellus region require advanced welding techniques and an extensive understanding of both mechanical and electrical engineering. WVNCC will increase the employability of their Mechatronics graduates with the inclusion of a hydraulics simulator into their curriculum. The simulator delivers training in the design, installation, and troubleshooting of complex hydraulic systems. Professionals with these skills coupled with a background in mechanical and electrical engineering are in high-demand to fuel the continued growth in the oil and gas industry nationwide. In addition, Dominion granted $50,000 to West Virginia University at Parkersburg to install a Lincoln VRTEX 350 Virtual Welding Simulator to allow students to learn and practice advanced welding processes in a safe environment. The computer-based training system provides students experience with a variety of joint configurations and materials. The simulator also greatly reduces the materials, energy consumption and associated costs of the program. “As new extraction methods are used in the Marcellus Shale region, advanced welding techniques and an extensive understanding of both mechanical and electrical technology will be necessary,” West Virginia Gov. Earl Ray Tomblin said in a news release. "In an effort to meet this demand for highly technical professionals, these grants will be used for cutting-edge simulators which will allow students to learn in a safe classroom environment." A Dominion spokesman said charitable giving and volunteerism are an integral part of Dominion’s commitment to the communities it serves. The Dominion Foundation contributes more than $20 million annually to non-profit organizations and schools. Foundation grants are funded by shareholder dollars and are not borne by customers, it was noted.